March 15, 2019. 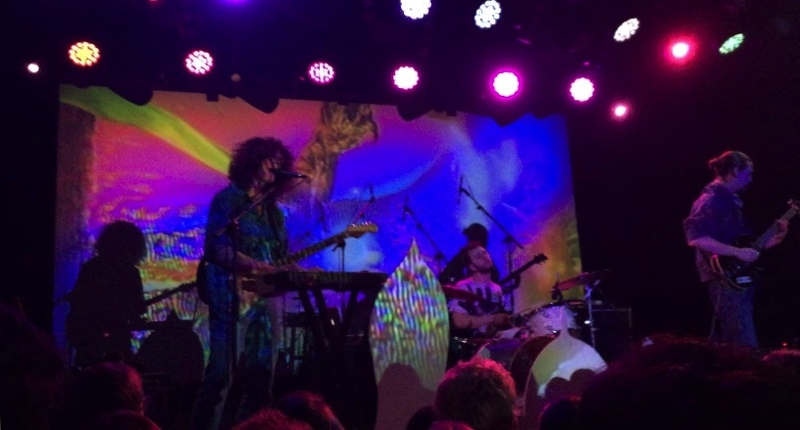 Vinyl Williams walk onto the stage at the Teragram Ballroom. Fascinated by their display set and obscure outfits, I squeeze my way to the front, curious as to what their music is like. Suddenly, psychedelic images light up the back wall as various scenes, mimicking that of Stefan Butler’s trip on LSD in Bandersnatch, play out. Completely entranced, I feel myself falling into oblivion as the scenes grow more and more hallucinogenic. As the band begins their set, I sway with the crowd momentarily forgetting about all of my problems. The last couple of months were rough as work, school, and various extracurriculars took a toll on my mental health. This stress spiraled into a pit of despair as depression, anxiety, and doubt ravished my life. For the 35 minutes they played, however, nothing else mattered except the figures in front of me. For 35 minutes, four years of distress melted away as an indescribable energy augmenting my emotions consumed me. For 35 minutes, foreign, paradoxical feelings replaced any and all thoughts as I found solace in the company of strangers. For 35 minutes, the Teragram Ballroom became my Eden. In many ways, it was a drug. Looking around, body against body, I notice many others in a similar state of nirvana and realize they’re just like me—survivors of this cruel, merciless world we call home.